You can create a cloud server in 60 seconds at four continents. Vultr pricing plans start at only $5 per month for 1 CPU, 768MB of RAM, 15GB SSD, 1TB Transfer and available in 14 cities worldwide. 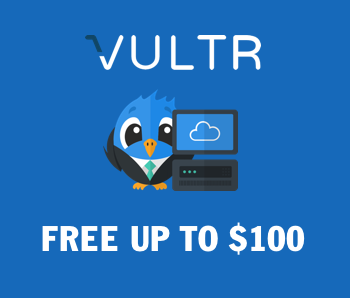 See latest Vultr Coupon before creating account to get free credit! * Bandwidth utilization in excess of instance allocation is charged at $0.02 per GB in North American and Western European locations. Due to higher regional costs, Singapore and Tokyo (Japan) overage is priced at $0.05 per GB and Sydney (Australia) overage is priced at $0.10 per GB. The Vultr Local Storage (VLS) plans make it simple to deploy a massive storage server in the cloud. Utilizing a local SATA backend integrated with SSD caching to boost performance, VLS instances make a great choice for a wide range of write and read intensive applications with large storage needs. Vultr Storage plans currently available in New Jersey, Los Angeles, Amsterdam, and Tokyo. VDC offers dedicated resources with cloud flexibility. With VDC product line, you’ll never share resources with another customer. Dedicated Cloud Instances offer resources allocated to you with no noisy neighbors. You can rent 25%, 50%, 75%, or an entire dedicated server with the advantages of the Vultr Platform including hourly billing and fast provisioning. Choose a plan with up to 4 x Enterprise SSD’s. Your disks will never be shared by anyone else. Need RAID? Choose 2 or more disks and setup your own RAID configuration! Choose up to 8 dedicated vCPU’s. Never share a CPU again. Each instance has 1GbE uplink with up to 40,000GB of data transfer! Deploy our blazing fast dedicated cloud resources in under a minute. Vultr Coupon Code has been started with the purpose of sharing Vultr's promotions to help others who want to try this provider. If you have any question, comment/feedback about Vultr Coupon Code, Gift Code or Promo Code please feel free to reach out any time. How to Use Coupon Code – Gift Code?